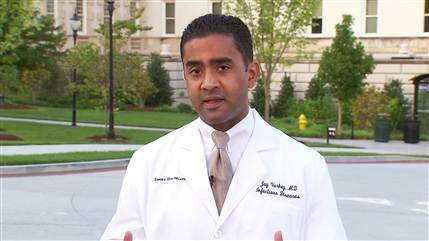 Atlanta, GA: An Indian-American physician, Dr Jay Varkey, is treating the American doctor infected with the deadly Ebola virus atEmoryUniversityHospital’s Infectious Disease Unit. The special isolation room at the unit has been used in the past including in 2005 for patients with SARS, reported 11alive. The patient’s family will not be able to visit him, but due to a glass partition and intercom, the family can watch and speak with the patient. Meanwhile the second American aid worker diagnosed with Ebola in West Africa was brought back to the US for treatment Tuesday, according to media reports. Nancy Writebol arrived in a private plane equipped with a unique containment unit at Dobbins Air Force Base near Atlanta Tuesday morning. She will join colleague Kent Brantly in a special isolation unit at Atlanta’s Emory University Hospital, Xinhua reported citing US media reports. SIM, the aid group with which Writebol serves, said she “remains in serious, but stable, condition”. Writebol was serving on a joint medical team in Liberia with Brantly of Samaritan’s Purse, an international relief organization, when they both contracted the virus. Brantly was brought back by the same medical evacuation plane Aug 2 for treatment.